Anthony S. Casey of Swiss Asia explains the firm’s offering of the Football Finance Note, and how it provides Asia’s wealthy with the opportunity to buy into English and European soccer. The next step is a similar product for other sports such as cricket, tennis, golf and more. 2017 is here. Anthony S Casey is proud to support the Little Sisters Fund based out of Nepal. He are continually impressed by the achievements of our Little Sisters. They have already completed so much in the past few months! At the request of our partner schools, we are expanding our primary educator training program to Middle School this year! Plus, Little Sisters is touring soon to visit supporters. The end of year fundraising campaign was a resounding success. Exceeded our goal by over 25 percent, over 2,000 girls are in school and Little Sisters is able to support them thanks to sponsors like Anthony S Casey. Here are some highlights from recent successes. Our Little Sisters receive the best education possible we strive to achieve this through the Primary Educator Training (PET) program. One school at a time, Little Sisters Fund continues to partner with schools to improve the Nepali education system for all students. PET trains primary level teachers to use child-focused teaching methods that encourage analytical and critical thinking. In 2016, we conducted 22 trainings in 8 districts. 360 teachers attended these trainings, indirectly impacting approximately 9,000 students throughout Nepal. In 2017 as we work toward our goal of training teachers in all 90+ LSF primary partner schools. The PET course has been so successful at the primary level that, at the request of our partner schools, we’re putting together a pilot program to extend the course to secondary level teachers. In Nepal, any disability, and specifically one of this magnitude, can keep a girl out of school and cloistered or hidden away in the home. Tribisha was born with spina bifida and must use crutches and leg braces to walk. She has always been determined to defy the odds that have been stacked against her since birth. Tribisha joined LSF in 2011. Now 16 years old, she inspires us with her determination and accomplishments. She was awarded the “Disabled Student Genius Award” for her high marks on the School Leaving Certificate exam in December and she will soon be publishing her first short novel, Niruta, which tells the story of the challenges a young girl faces growing up in Nepal. Little Sisters is incredibly proud of Tribisha’s achievements and we look forward to watching her continue to inspire the girls who follow in her path. Read more of her story on LittleSistersFund.org. The Little Sisters Fund helps economically disadvantaged Nepalese girls to become empowered leaders. Through education and community support, we aim to contribute to the development of a more equitable and prosperous world. All children deserve the right to education, regardless of the basis of gender. With the Little Sisters Fund, 98% of Little Sisters continue in the program and with their studies every year. To compare, only 56% of poor rural girls complete primary school, and just over 20% complete grades 9 and 10. The Little Sisters Fund is filled with gratitude for the opportunity of the future, of 2017. Continuing to support over two thousand Little Sisters, they are extraordinarily grateful for the chance to continue letting their lives flourish. They show dedication and compassion every day. The gratitude they show on a daily basis inspires us to work even harder. Each Little Sister’s education is fully funded through twelfth grade and that they will soar into college and their adult life after they graduate from our program. Happy 2017 from the Little Sisters Fund. Hopefully it is filled with the same compassion, dedication, and gratitude lived out by the Little Sisters every day. The question for social investors of starts with how can you make the world a better place? Understand the needs of others. Open yourself up to critique and listen to advice from those affected by the issue. Understanding is a process that requires us to orient our ideas toward appropriate intervention. Social investing can come in many forms. While altruism and guilt seem to be the prime motivator for investing in social issues, making an impact has started to surface as a third form of motivation with expectations of market-rate returns for social investments. Social investors are driven by the aspiration to build something positive rather than the desire to fix existing liabilities and weaknesses. Social investment is repayable finance that creates both social and financial returns. It is provided to charities, social enterprises and socially motivated businesses. Investors expect to get their money back (often with interest) and expect the finance to have created identifiable social impact. Social investment is not a grant or a donation. This group of aspirational investors typically use a value-based investment to build and manage their portfolio. Portfolio managers conduct all of their activities from selection and due diligence to impact assessment. In the faith-based investment category, a strong focus on human dignity and stewardship of the environment from the lens of charity. The focus is on projects that help the poor or less fortunate. These investments exclude industries such as tobacco, alcohol, and gambling. Gender investment benefits women who are otherwise overshadowed. Investing provides more equal opportunities, better access to the labour market and thus better social protection. Social Investing solutions aim to provide great value to the world, beyond fiscal greed. The greatest value is achieved when social goals are at the forefront of the business strategy. There is a clear desire of investors to earn a stable return, all while achieving social impact. It’s festival season in Nepal! Late October and early November bring the two most celebrated festivals of the year for Hindus around the world. Dashain celebrates the victory of the Hindu goddess, Durga, over the demon, Mahishasura, and is the longest and most auspicious holiday in Nepal. The festival of Tihar follows and is celebrated by worshiping different animals and gods for five days. During both festivals, it is common for people to bless each other by sharing Tika (red dots on the forehead) with mothers, fathers, brothers, sisters, elders. Nepal is filled with a wonderful spirit and joy is in the air. We are also reminded of how much we have accomplished this year, and how much we have to look forward to. Since March, Little Sisters in Nepal continues to grow with the flourishing of new community projects program. Plus, the newest U.S. based staff member, Abigail Akre began in August and has already contributed so much guidance. In September, new partnership with Keene State College was born. For more information about these programs please continue reading below. There are over 2,000 Little Sisters and 300 graduates in 20 districts throughout Nepal. The girls continue to surpass national averages in school continuation rates and exams. They are safe and are growing into remarkable young women, role models, and leaders at school, at home, and in their community. They are doing exceedingly well and we are so proud of them. Our Little Sisters have really grown into empowered young leaders. The community projects program has been a roaring success even in its first year! 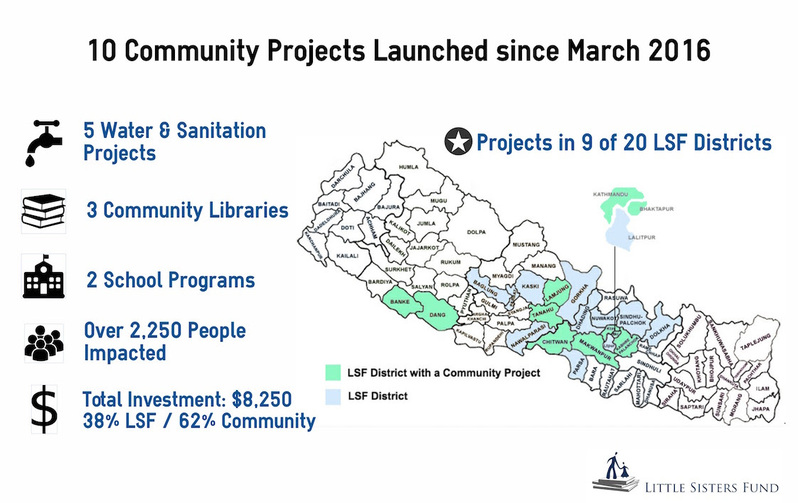 Since March 2016, Little Sisters has approved 10 community projects in 9 districts. There are several more ahead of us. These projects are designed and proposed by Little Sisters, who lead their communities to bring their ideas to life. We just provide a little seed money to help get the project started, and the girls, their families, and community members take it from there. Now this is some serious work from young community leaders. Keene State College will now offer two scholarships to graduating Little Sisters for the 2017-2018 academic year. Keene State College is a small liberal arts college in New Hampshire that now joins the ranks of the LSF Partner Universities—Shenandoah University, Centenary College of Louisiana, and the Asian University for Women—to provide Little Sisters the opportunity to continue their education abroad. It’s been a great year for the Make-A-Wish Foundation in Singapore, an organization Anthony S Casey is proud to be a part of. Anthony would like to share the story of Raphael. Raphael was diagnosed with acute lymphoblastic leukemia, but it hasn’t stopped him from being his hyper and active self. When his Wish Granters discovered his dream about an awesome Nerf War Party, they dreamed up the best wish day ever. With a lot of encouragement from Raphael’s class teacher and principal, his school hall into an Nerf War Boot Camp. Complete with obstacle courses, camouflage netting and Nerf guns, the boot camp was actually one big surprise. During a phys. ed class, he was completely taken aback. He walked into the hall; instead of gym class, a nerf war party! It wasn’t easy, either. The obstacles required jumping, crawling, balancing, throwing and marksmanship training with Nerf guns. On his Wish Day, Raphael was escorted by a convoy of Land Rovers to his wish party venue. Outfitted in a soldier’s uniform tailored to his size and sporting a beret, Raphael looked very much the part of a soldier defending his country against the “red army”. Thanks to his Wish Granters Christie, Jonathan and Hao Ren, Land Rover Singapore for the spectacular convoy, and the dozens of volunteers who made the Nerf war party a memorable one for Raphael to cherish. Make-A-Wish reminds you to sign up for the Santa Run this November to fundraise for this great foundation. Last year over 3,500 runners participated in the event. If every one of us inspires just 1 other person to join, we could double that number! 5,000 Santas is the goal. Register now and receive a Santa or Elf t-shirt, designed special for the event. Or, come as a favorite holiday character or tradition, in your most creative Christmas-themed costume. If you win best-dressed you will recieve a four day three night ClubMed Bintan trip for two adults and two children! All registration and donation proceeds will go towards Make-A-Wish in granting the wishes of children with life-threatening medical conditions. Registration ends soon so sign up now here or call 63349474 for more information. Anthony S Casey can’t wait for you to join Make-A-Wish Singapore! Millennials is not always a nice term. People typically think of this generation as a self-centered, lazy, materialistic bunch. But, millennials are actually a lot more generous than you think. According to an article in CNBC, millennials are on track to be the next major donors. On average, millennials donate an annual gift of $481 US dollars. An article from the Case foundation cites that millennials practice philanthropy in the same ways as older generations. But, their underlying motivations are different. Passion, meeting people and enhancing expertise in certain fields now influence this young influential generation to contribute to their society. The generation of coffee-drinking, small-batch draft beer preferring college-educated courageous young people, or sometimes known as millennials, who are heralding in a new age of giving. Because of this, we need to think of an “appendage” to the existing definition of philanthropy, which reflects new criteria and includes the time spent with the cause, talent one can use to benefit the cause, financial contributions donated for charitable work (even $5 per month), the influence of an individual’s voice advocating and educating others, and the potential to grow one’s network through leveraging personal and professional relationship. Millennials are happy to participate. It’s good for nonprofits and charities to institute a set of guidelines for volunteers and donors. This way institutions can expect them to work or give within those specific parameters without risking losing your framework. Why turn away something positive and impactful just because it’s not the way you’ve always done things? Remember, millennials don’t “give” to organizations. They support causes. Because this demographic typically spends so much of their social lives on the internet, on platforms like Facebook and Instagram, they have the power to connect with hundreds of people to a cause they’re passionate about. Nonprofits are now forced to clean up their act and be a little more transparent. This is because millennials demand engagement. These people want to be informed of where their money is going and how they are making an impact. They’d rather stay connected than donate once and forget about it. Stay in touch with these young philanthropists and philanthropy will change forever. Follow Anthony S Casey Singapore on Twitter for more. The football world has many excellent philanthropists, as I detailed in a previous post. Let’s take a look at another great example; a footballer so successful, their star so bright, that their massive contributions are easy to overlook. I’m talking about none other than Cristiano Ronaldo. Cristiano, despite his sometimes tiring dramatics on the pitch, is an accomplished philanthropist. The son of a gardener, Ronaldo has excelled at football’s highest stages for his current club, Real Madrid. And he has been rewarded handsomely. He takes down around £230,000 a week in salary alone. Add that to his numerous endorsement deals and we are talking about an extremely wealthy individual. To be fair, he has absolutely earned it. Ronaldo’s accomplishments are numerous, both with his teams and as an individual. He was with Manchester United from 2003 to 2009, contributing to 3 league titles, including a double winner when they took the Champions League in 2008. That same season, he was awarded the Ballon d’Or and a laundry list of other accolades. For Real Madrid, he has won La Liga, taken the Copa twice, and most recently personally sealed the Champions League victory in penalties (after a fairly tame 120 minutes of play). Add to that Portugal’s victory in the Europeans Championship this summer and Cristiano has really done it all. But what has he done for the world at large? As it turns out: a lot. Ronaldo’s philanthropy started early. In 2004, when the Indian Ocean earthquake and tsunami devastated Indonesia, television cameras captured a child wearing the Portuguese number 7 shirt. The boy has survived for 19 days alone after his family was swept away. After seeing the footage, Cristiano traveled to Aceh, Indonesia to raise money for the rebuilding process. After his mother battled and beat cancer at a hospital in Madeira, Portugal, Cristiano donated £100,000 to the institution to build a cancer centre. He returned to Madeira in 2010 after floods devasted the area to raise money in a charity football match. After winning the Golden Boot in 2011, he sold the thing and donated the 1.5 million pound purse to pay for schools in Gaza. In 2013, Cristiano was named Save the Children’s newest Global Artist Ambassador. Recently, he launched an app called CR7Selfie which raises money for Save the Children. He also joined Drogba and others in FIFA’s “11 against Ebola campaign”. His latest gesture came after his club’s win in the Champions League in Milan. Cristiano netted the winning penalty, and then (after some celebrations, surely), donated his £600,000 bonus to charity, in its entirety. Those are just a handful of the ways that Cristiano Ronaldo has given back. It’s no wonder that DoSomething.org named him atop their list of most charitable athletes in 2015. To see more from Anthony S Casey, check out his Twitter.